Celebrate Arch Madness at Mid-South Spine and Sports Performance! 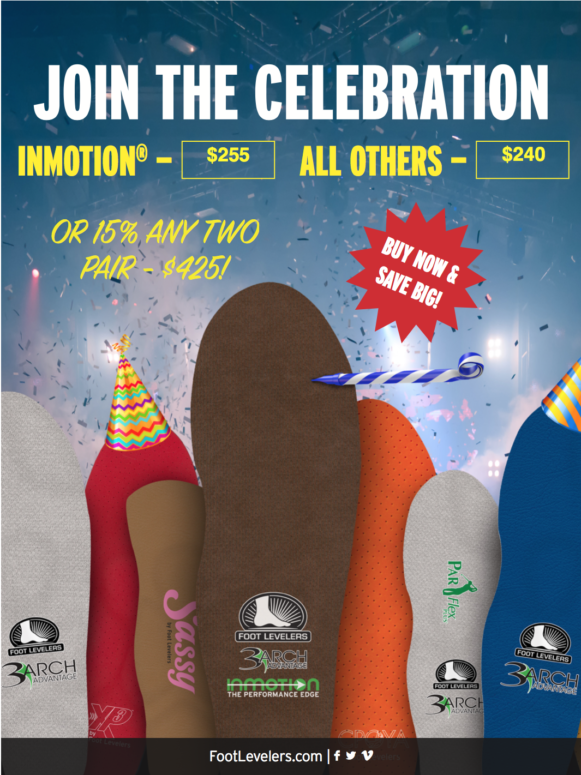 Join us in celebrating our Arch Madness promotion on Foot Levelers custom made orthotics at Mid-South Spine and Sports Performance! If you’ve read any of our past publications on the importance of a quality custom foot orthotic, and have been wondering if Foot Levelers are right for you, now is a great chance to find out! Now until the end of April our entire line of Foot Levelers orthotics are being discounted 15, even 20% off! If you have joint or back pain, problems in your feet could be to blame. A team is only as strong as its weakest member. Feet are the body’s foundation—if they can’t pull their weight, the rest of the body suffers. Foot Levelers’ 3 Arch Advantage to help shift the body into proper alignment—reducing pain, improving physical performance, and enhancing healing. Are you curious about the biomechanics of your feet, or if your feet could be affecting the rest of your body? We offer a free consult and diagnostic foot scan to help you determine your need for orthotics. Be sure to check out our website for more information about Foot Levelers, or to schedule a visit with Dr. Detweiler!